Tales of the Tai-Pan Universe, launched in January 1992 by a consortium of Seattle-area furry writers, artists, and editors, and the oldest on-paper furry fanzine still being published, released its fiftieth issue in September 2012. Despite its website’s continued online presence with its semi-annual schedule, the long delay since number fifty was published has resulted in a growing doubt that it is still in existence. Now editor Gene Breshears has stated that issue number fifty-one is finally ready for the printer, and should be out by the end of this month, or August 2015 for sure. The delay has been partly due to the requirement that all stories in Tales of the Tai-Pan Universe must be consistent with that fictional universe’s 36th-century interstellar storyline. With over a hundred stories by different authors, making sure all details, references, and characterizations are consistent, and the need to get illustrations for those stories, all on a volunteer basis, means it is getting increasingly difficult to prepare an issue. But Tai-Pan fans can relax with the expectation that issue number fifty-one is about to appear. 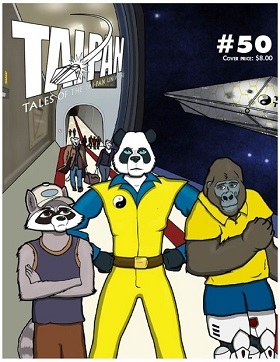 Update: Tales of the Tai-Pan #51 & #52 have been published as a double issue – its last.